DP-DMX20L dimmer ... is it 20A or 15A max? I see that Elation has a version of the DP-DMX20L with the Elation logo. Is this the same as the ADJ version? I am utterly confused trying to figure out the maximum rated amperage draw for this dimmer pack model. Some say 15 amp, some say 20 amp. If I were to buy a DP-DMX20L used, how do I know which current rating I will get? Small request, if Elation or ADJ changes the product's current ratings, could you also change the model number so that two completely different products don't overlap each other? Though it is a bit late to start calling the 15 amp max version the "DP-DMX15L". 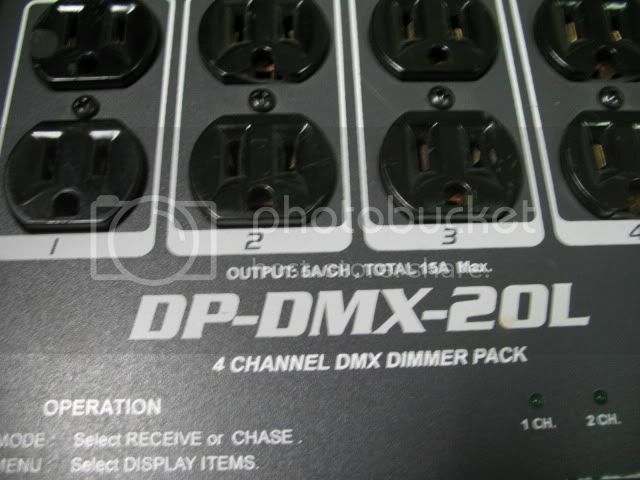 Maybe the 20A version should be called the "DP-DMX25L", and the 25A version the "DP-DMX30L". No no, something doesn't seem right about this.. It's rated for 15 amps total. Check your plug. Are the two blades straight? If so, that's a 15-amp connector. Is one blade at a right angle to other? That's 20 amps. Yes, I know, they are both basically the same and chances are the cable itself is rated for 20 amps anyways. Worse case situation is blow a fuze or pop a breaker. That annoying right angle plug thing. I have chopped off and replugged/bent straight more of those things then I care to count. The only real reason why it is there is because people try and do stuff cheap aka use 14/3 and 16/3 instead of 12/3. I don't doubt you in the least. Furman even makes an AC power conditioning product rated at 20 amps, and they know the problem is so prevalent that they even state that they won't honor the warranty if there are "Field modifications" made. My attitude is that I'm protecting 15 amps worth of gear, so I want the unit rated at 15 amps, mainly so I can pop my breaker instead of the house breaker. If anyone has seen a 20-amp Edison outlet, they'll note it's completely backwards compatble. So it's not like the outlet is gonna say "nope, wrong way, not working". On a simlar note, my KV2 Audio EPack 2500 cables go from a 15-amp Edison(heavy duty) to a 20-amp Nema twistlock. The EPack WANTS 20 amps of current, but apparently they know something.... I've routinely run 2 of them, each powering a double 15-sub and a 3-way top(all being active driven) to PAINFUL levels for crowds of over 1000 people off a single 15-amp circuit and had headroom to spare, on the console, current and amp. Oh, BTW, I have a 4-wire appliance cable I've modified for a 30-amp distro I have. That cable terminates into a 30-amp twistlock F, which mates with the M cable on the distro. I need to make a second one. (I have two distros). I can pull power from people's drier outlets, or this one venue that mounted one on the floor using my adaptor cable. For my Black & Decker generator, the twistlock goes right in. Actually, there are 20 amp only Edison outlets out there. Why, I have no idea. They are few and far between but I have seen them. The one that comes to mind is Pfizer's (use to be Wyeth's) Collegeville Campus here in PA. In Campus Commons Dining area, there is one 20 amp outlet and the rest are 15/20 amp right above it. Why it is there, I have no idea. But again, its annoying because I have to drop mult down from upstairs for more power often. 20-amp only? That must be reserved for some specific bit of hardware, best I could guess. That would make more sense in a hospital. I've never seen a 20-amp only outlet, always the typical 15/20 that has the T on the neutral for "compatibility". One thing I do these days with new venues is I have one of those pen-type devices that can detect a live circuit. If I have a live circuit, next thing I do is meter it and document that on a per outlet basis. I've only run into 1 problem: an outlet was only providing 97 volts so I had to pull from another circuit. I told the owner of this problem and they got it fixed. The rest of the time, it's the typical "we show 120 volts" but when you apply a load, the voltage drops due to weak power entering the service panel. Yeah, I can see a 20-amp ONLY being a PITA. If I were you, I'd just make a quick pigtail that adapts a 20-amp Edison male to a 15-amp Edison female and be done with it. I'm sure you've got a cable you can sacrifice, or at least lop off a bit of. I bet in your case, you've got some old but decent cables lying around that could be recycled in part for this project. Yes I'm a little late to this party but in the USA generally 20A only outlets were used for air conditioners.